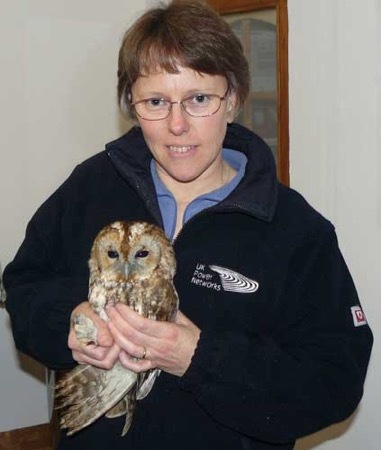 A mature tawny owl is back in the wild this week thanks to quick-thinking of an alert driver. Heather Patrick was returning from a meeting with local branch of the Suffolk Wildlife Trust when she came across the stunned bird sitting in the centre of a busy carriageway, very probably having been clipped by a passing vehicle. Thankfully, Heather managed to avoid further harm being done. Perfectly equipped to handle the situation, as an environment adviser with UK Power Networks and had a hi-vis jacket and leather gloves in her car, part of her regular safety and protection gear. Heather was able to keep her household guest warm and safe overnight until she was able to speak to bring the owl in to us for a check-up the following morning. A few days later, after the Tawny had received some TLC and enjoyed a little quiet recuperation time, her bruised wings had fully recovered she was passed 'fit for flight'. Heather then collected her from the Sanctuary took her for release her back into the wild near to the spot where she was discovered.